David Kenny is about two months into his new job. He's the General Manager of IBM Watson -- the company's cognitive computing platform -- and was stuck on a plane for half an hour before our phone interview. He had just flown into Augusta, Georgia for the Masters. Bad weather caused a pileup of arrivals. The airport ran out of open gates. His flight was stuck on the tarmac. If air traffic controllers had access to Watson, they might have been able to forecast the flight congestion. Watson could have proactively asked workers if they wanted to move gates around based on its weather predictions. It could have prompted airlines to delay departures from other locations, or helped airlines tell passengers (like Kenny) that they would be stuck on the tarmac -- ahead of time. After all, IBM already builds apps for airlines and airports to manage everything from fuel usage, to passenger boarding and re-bookings. Helping people make decisions based on deep data analysis is sort of Watson's sweet spot too. 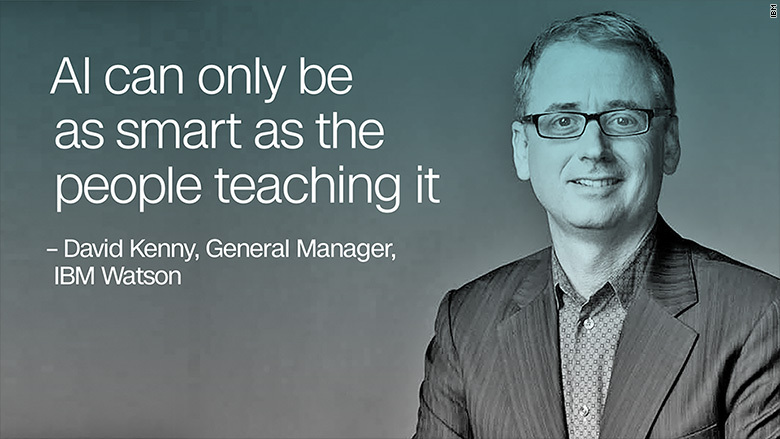 "Our advantage is interacting around expertise," Kenny told CNNMoney. And that's what makes Watson stand out from its competitors. 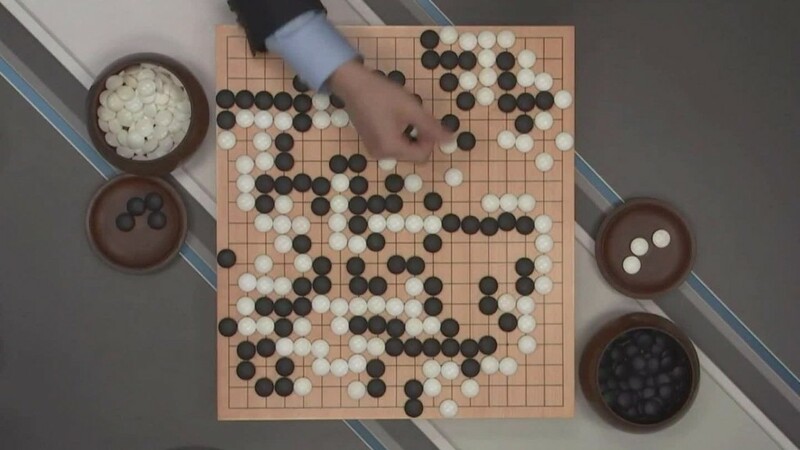 While companies like Microsoft (MSFT), Google (GOOGL) and Facebook (FB) have been racing to build AI platforms to help consumers organize personal information, IBM (IBM) wants its Watson platform to be the problem-solving engine for businesses. Whether workers need help with an accounting audit, medical diagnosis, formation of a legal strategy, valuing stocks for a portfolio or even shopping for a new coat, Watson can be trained to learn as much as possible about a particular topic and recommend multiple answers to certain questions. "We work with companies and institutions to make sense of their data," said Kenny. Before joining IBM, Kenny was the chairman and CEO of the Weather Company. IBM acquired the firm (minus its TV division) last year, and the deal closed in January. The marriage may seem a bit odd, but it actually makes a lot of sense. Many industries rely on weather predictions to operate. Kenny says he hopes to "help connect weather to more decisions," like optimizing supply chain management. Take agriculture and shipping for example. Farmers use Watson to understand what their sensors are saying so they can decide the ideal time to plant or harvest their crops. Trucking companies use it to predict weather conditions that could cause delays and lead to spoiled foods and lost revenue. The Watson platform is made up of over 50 technologies that can do everything from analyze tone in text and speech, to identify human age and gender. Despite what Watson can handle, Kenny says there's still a lot more it could do. For starters, he thinks that AI and machine learning systems need to do more "abductive reasoning" as opposed to deductive reasoning. That means making more inferences about facts rather than drawing conclusions based on a set of rules or path of logic. The advantage of more abductive reasoning is that it will lead to conversation and dialogue with humans, according to Kenny. And that in turn will lead to more creative thinking because machine learning means cognitive computing systems will become smarter over time on their own. Think about fashion advice. Watson would have to rely less on hard facts and more on a personal understanding of someone's tastes -- objectives best achieved through conversation. Right now AI is more about people querying machines. "My dream is that Watson will ask us questions," said Kenny. In order to advance Watson to the point of more natural dialogue, it needs to spend as much time as possible with as much data on what it's being asked to analyze as possible. On top of that, Watson also needs to spend as much time as possible with the people who will ultimately use that data. That way, Watson can learn how someone makes decisions, and that person can gain enough trust in Watson's recommendations. This is not unlike the way our phone's predictive keyboards work. At first we have to double check that the suggested words are correct, but then after time, we trust it to show us the words we intend to use. "AI favors incumbency," said Kenny. "[It] can only be as smart as the people teaching it."